For our Top Performance in Strategic Account Management Benchmark Report, we studied two specific processes for driving value with accounts. The first is internally focused: whether or not the organization has a strong process for assessing and evaluating additional value they can bring to strategic accounts. The second is external: whether or not an organization has a strong process for working collaboratively with strategic accounts to co-create value in new, innovative ways. The difference between Top Performers and The Rest was stunning. Top Performers are 2.2x more likely to have a strong process for driving value both internally and externally. When companies were effective at both processes, we labeled them “Value-Focused Organizations.” These value-focused companies produced more new business opportunities and had better client satisfaction. 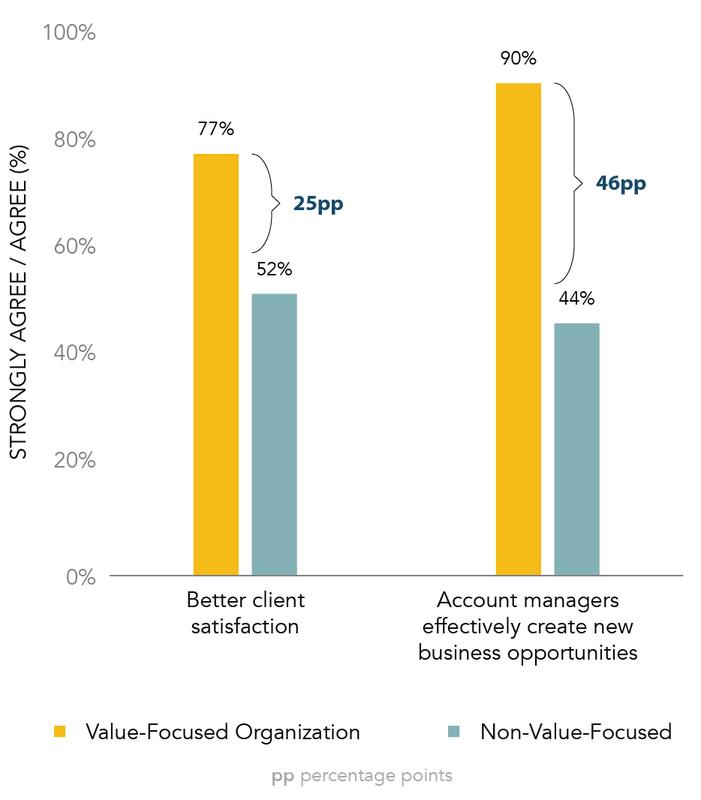 Producing this kind of result is the holy grail of strategic account management: expanded business opportunity and higher satisfaction at the same time. Follow a process: As a matter of course, for every strategic account, they follow a series of stages and steps to build a plan to grow their accounts. Read more about the 5 stages of the strategic account management process. Lead Value Labs: Top Performers lead collaborative, facilitated meetings following a specific process to uncover ways they can maximize value for accounts. By focusing on the value they can provide (versus focusing on products and services they can sell), they make a compelling case for the account to take new courses of actions. This leads to new and more products and services sold. Use an account-planning tool: The right tool can help you evaluate additional value you can bring to your accounts and brainstorm ways you can co-create value with them. 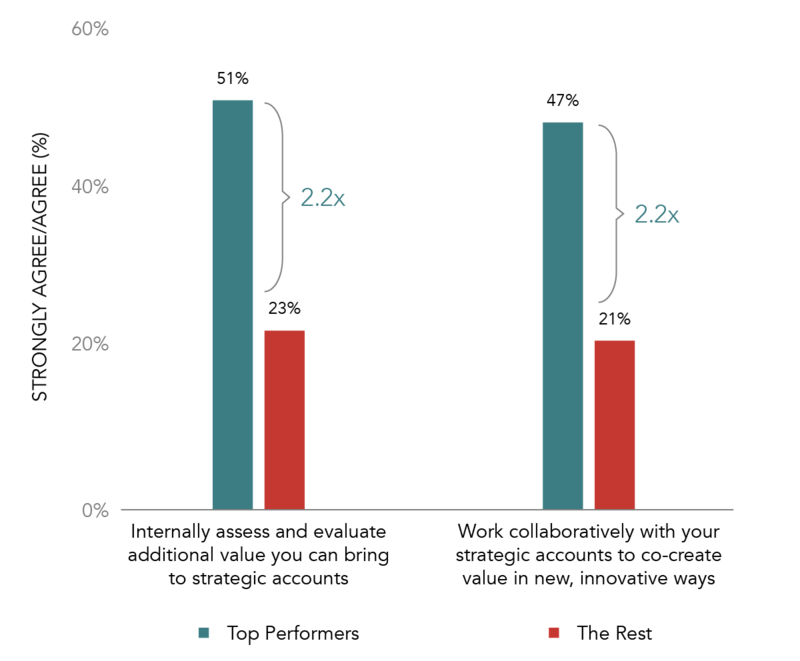 In fact, Top Performers were 2.5x more likely to have an effective process for building account plans, and were much more likely to have an effective account-planning tool. Read more for the 6 elements of an effective account-planning tool. Follow an account-growth proccess that is value centric and you'll remember to lead a Value Lab, one that puts the account first. Lead a Value Lab, and you'll generate compelling ideas for growing accounts. Use a good planning tool, and you'll have a good roadmap for what specific new ideas you believe will inspire your accounts. Do these things and you, too, can achieve the holy grail of strategic account management.